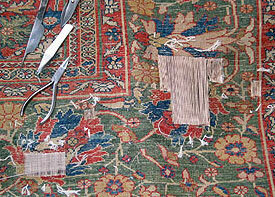 Antique Rug Company has served Newport Beach’s Oriental rug repair needs since 1980. Please contact our showroom to come in or schedule pick up and delivery. Pick up and delivery is available in all surrounding areas including for Newport Beach zip codes 92603, 92625, 92657, 92659, 92661, 92663, 92617, 92651, 92658, 92660 and 92662. Your handmade rugs are works of art. 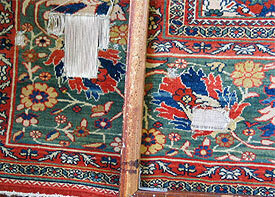 Antique, collectible, vintage, family heirloom or new, all rugs should be inspected, maintained and cared for as they are used over the years. 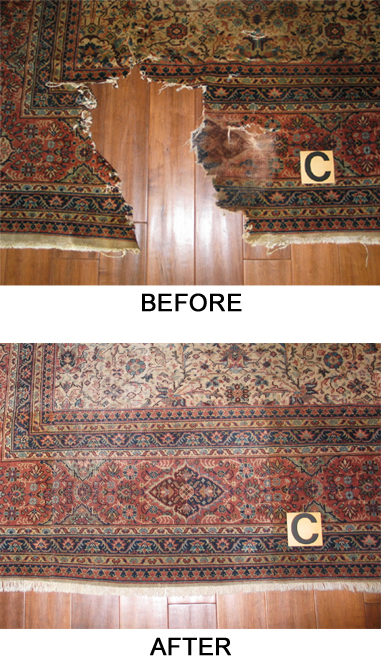 Protect and enjoy your valuable rug investment by following the simple maintenance and conservation steps outlined in our RUG CARE section. But when damage happens, keep in mind it is best to seek advice and remedy to avoid further damage. The professional rug weavers and restorers at our repair workshops provide you expert maintenance, repair and restoration advice and services. 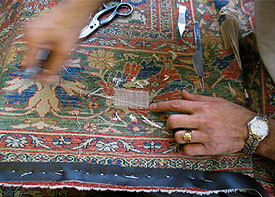 We can repair all types of handmade and machine made area rug — Oriental, Persian, Navajo, mechanical or other.